Orange Beach, Alabama -- While President Obama insists that the federal government is firmly in control of the response to BP's spill in the Gulf, people in coastal communities where I visited last week in Louisiana and Alabama know an inconvenient truth: BP -- not our president -- controls the response. In fact, people on the ground say things are out of control in the gulf. For example, while flying on a small plane from New Orleans to Orange Beach, the pilot suddenly exclaimed, "Look at that!" The thin red line marking the federal flight restrictions of 3,000 feet over the oiled Gulf region had just jumped to include the coastal barrier islands off Alabama. "There's only one reason for that," the pilot said. "BP doesn't want the media taking pictures of oil on the beaches. You should see the oil that's about six miles off the coast," he said grimly. We looked down at the wavy orange boom surrounding the islands below us. The pilot shook his head. "There's no way those booms are going to stop what's offshore from hitting those beaches." BP knows this as well -- boom can only deflect oil under the calmest of sea conditions, not barricade it -- so they have stepped up their already aggressive effort to control what the public sees. At the same time I was en route to Orange Beach, Clint Guidry with the Louisiana Shrimp Association and Dean Blanchard, who owns the largest shrimp processor in Louisiana, were in Grand Isle taking Anderson Cooper out in a small boat to see the oiled beaches. 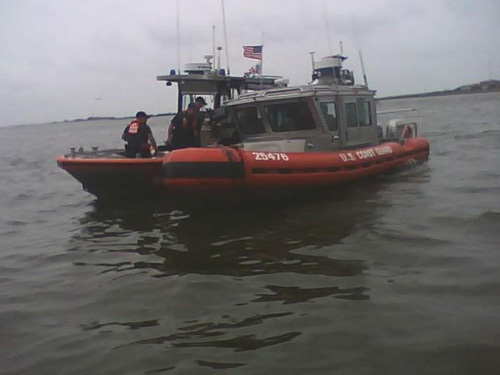 The U.S. Coast Guard held up the boat for 20 minutes - an intimidation tactic intended to stop the cameras from recording BP's damage. Luckily for Cooper and the viewing public, Dean Blanchard is not easily intimidated. A few days later, the jig was up with the booms. Oil was making landfall in four states and even BP can't be everywhere at once. CBS 60 Minutes Australia found entire sections of boom hung up in marsh grasses two feet above the water off Venice. 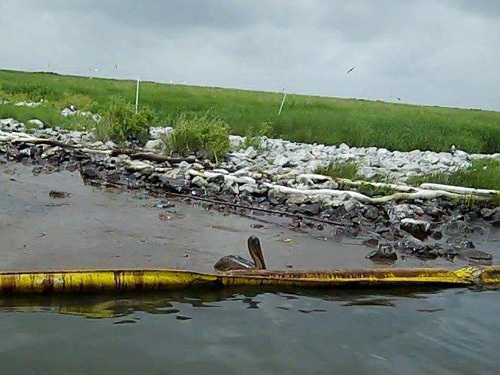 On the same day on the other side of Barataria Bay, Louisiana Bayoukeeper documented pools of oil and oiled pelicans inside the boom - on the supposedly protected landward side - of Queen Bess Island off Grand Isle. With oil undisputedly hitting the beaches and the number of dead wildlife mounting, BP is switching tactics. In Orange Beach, people told me BP wouldn't let them collect carcasses. 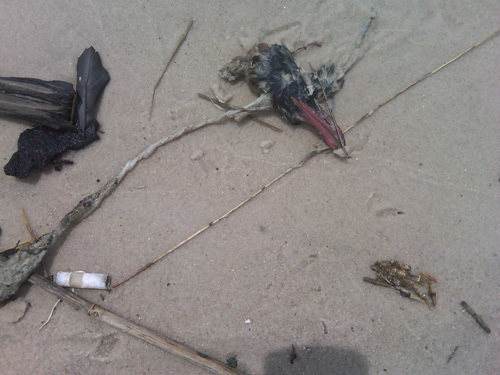 Instead, the company was raking up carcasses of oiled seabirds. "The heads separate from the bodies," one upset resident told me. "There's no way those birds are going to be autopsied. BP is destroying evidence!" The body count of affected wildlife is crucial to prove the harm caused by the spill, and also serves as an invaluable tool to evaluate damages to public property - the dolphins, sea turtles, whales, sea birds, fish, and more, that are owned by the American public. Disappeared body counts means disappeared damages - and disappeared liability for BP. BP should not be collecting carcasses. The job should be given to NOAA, a federal agency, and volunteers, as was done during the Exxon Valdez oil spill in Alaska. NOAA should also be conducting carcass drift studies. Only one percent of the dead sea birds made landfall in the Gulf of Alaska, for example. That means for every one bird that was found, another 99 were carried out to sea by currents. Further, NOAA should be conducting aerial surveys to look for carcasses in the offshore rips where the currents converge. That's where the carcasses will pile up--a fact we learned during the Exxon Valdez spill. Maybe that's another reason for BP's "no camera" policy and the flight restrictions. On Saturday June 12, people across America will stand up and speak out with one voice to protest BP's treatment of the Gulf, neglect for the response workers, and their response to government authority. President Obama needs to hear and see the people waving cameras and respirators. Until the media is allowed unrestricted access to the Gulf and impacted beaches, BP - not the President of United States - will remain in charge of the Gulf response. For more information on community rallies, please visit HERE.